In the September issue of Geochimica et Cosmochimica Acta, O. Nehlich and colleagues use sulphur isotope analysis to investigate the diet of 83 individuals from three Roman-era sites in Oxfordshire, England. Their hypothesis was that sulphur isotopes, in combination with carbon and nitrogen isotopes, would reveal an additional facet of the diets of people in the area. Sulphur isotopes have started to gain in popularity, as they're useful for separating marine and terrestrial protein (much like nitrogen isotopes are), for indicating freshwater resource consumption (which C/N isotope analysis can miss), and for tracking migration (in a similar manner as oxygen isotope analysis). 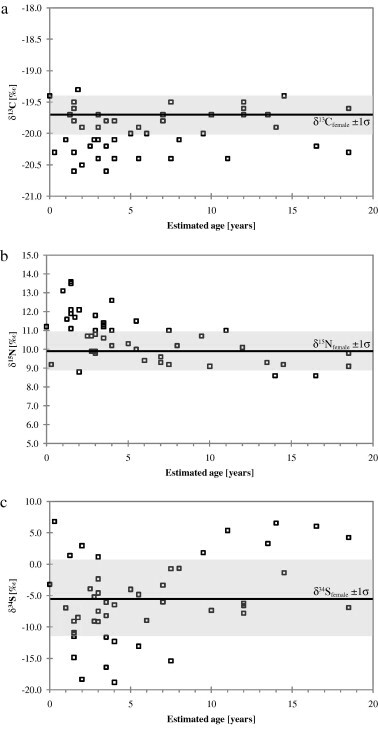 Nehlich and colleagues also wanted to apply sulphur isotope analysis to infants. It is well known that nursing infants have dramatically different nitrogen isotopes than adults, and there is growing evidence that carbon, oxygen, and strontium isotopes are also affected by nursing. It's not a particularly surprising result, since some of these individuals lived along the Thames River, but sulphur provided the researchers additional information about diet that the carbon and nitrogen isotopes couldn't tease out. may, however, be more like a curve. The really interesting finding in this article, though, is that sulphur isotopes can provide additional information about patterns of breastfeeding and weaning. The original study by Fuller and colleagues had found 13C-depleted values for infants in the range of 2-4 years, which the authors interpreted as a unique weaning diet composed mostly of C3 plants and terrestrial meat, and surprisingly variable d15N values suggesting weaning was a gradual process. Sulphur, like nitrogen, has a small trophic effect, meaning infants consuming their mothers' tissues (in the form of breastmilk) typically have higher isotope values than the adult population. However, Nehlich and colleagues didn't observe any striking patterns in 34S enrichment. They conclude that the pattern Fuller and colleagues saw is actually the result of consumption of freshwater fish or other foods influenced by freshwater hydrology - such as grains that grew near freshwater sources. Nevertheless, they also found that kids 8 years and older have more 34S-enriched values, suggesting they were eating mostly terrestrial protein. As I just finished up the (hopefully) final draft of my article on carbon and nitrogen isotope analyses of the Imperial Roman diet, this sulphur study has been on my mind. I've written before about the problem of aquatic resource consumption in the Roman diet - sometimes fish were seen as the lowest form of food, and sometimes they were highly prized (e.g., in the form of garum, a fish sauce). Neither of my populations lived particularly near the Tiber River, but the people buried in the St. Callixtus catacombs also weren't that close. 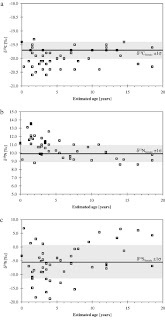 The Callixtus palaeodiet reconstruction by Rutgers and colleagues (2009), though, suggests freshwater resource consumption because of the comparatively low carbon and high nitrogen isotope values. The Callixtus skeletons would therefore be an ideal place to start a sulphur isotope study in Rome. It might also be useful to do a sulphur isotope study on the infants buried in Isola Sacra, whose skeletons gave Prowse and colleagues (2004) quite a bit of information about weaning and diet. 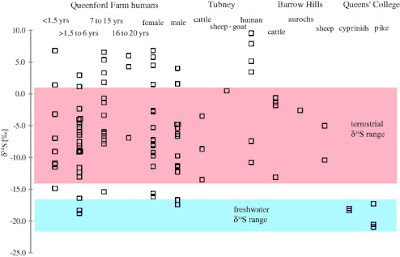 Interestingly, the ages at weaning in Roman Oxfordshire and in Portus Romae seem to differ a bit: while Fuller and colleagues think weaning took place from 2-4 years old, Prowse and colleagues found that kids were fully weaned by 2.5-3 years of age. Analyses of carbon and nitrogen isotopes are increasingly showing us that there was no monolithic Roman diet, and that consumption of resources varied by age, location, time period, and (probably) status and religious/ethnic group. Isotope analysis isn't perfect, but it is a powerful technique for looking at palaeodiet, and I hope that these bioarchaeological findings start being incorporated into general treatises on the ancient Roman diet. For example, the recent book Taste or Taboo (Beer, 2010) is excellent but mentions no biochemical analyses of the Roman diet. Part of this disconnect between anthropology and classics is the fault of bioarchaeologists. After all, we publish in journals that further our careers, like the American Journal of Physical Anthropology, Journal of Archaeological Science, and Geochimica et Cosmochimica Acta. These aren't top on the list of journals that classicists want to read, and the language of the latter two is generally highly technical, which can be problematic when a classicist does attempt to delve into the scientific data (as I've written about here in the Journal of Roman Archaeology). One of my goals for this blog is to widely disseminate bioarchaeological work and get it noticed by classicists, anthropologists, and the public alike. But the classicists interested in diet, migration, and burial would also do well to start perusing anthropology journals, contacting article authors if the paper is too technical, to really understand what we can contribute to the study of the ancient Romans. Beer, M. (2010). Taste or Taboo: Dietary Choices in Antiquity. Prospect Books. Fuller BT, Molleson TI, Harris DA, Gilmour LT, & Hedges RE (2006). Isotopic evidence for breastfeeding and possible adult dietary differences from Late/Sub-Roman Britain. American Journal of Physical Anthropology, 129 (1), 45-54. PMID: 16229026. O. Nehlich, B. Fuller, M. Jay, A. Mora, R. Nicholson, C. Smith, & M. Richards (2011). Application of sulphur isotope ratios to examine weaning patterns and freshwater fish consumption in Roman Oxfordshire, UK. Geochimica et Cosmochimica Acta, 75 (17), 4963-4977. DOI: 10.1016/j.gca.2011.06.009. Prowse, T., Schwarcz, H., Saunders, S., Macchiarelli, R., & Bondioli, L. (2004). Isotopic paleodiet studies of skeletons from the Imperial Roman-age cemetery of Isola Sacra, Rome, Italy. Journal of Archaeological Science, 31 (3), 259-272. DOI: 10.1016/j.jas.2003.08.008. Rutgers, L., van Strydonck, M., Boudin, M., & van der Linde, C. (2009). Stable isotope data from the early Christian catacombs of ancient Rome: new insights into the dietary habits of Rome's early Christians. Journal of Archaeological Science, 36 (5), 1127-1134. DOI: 10.1016/j.jas.2008.12.015.